Once in a while, I, or one of my colleagues, neglect to set the density of a part and the mass of the assembly is reported as something huge. Usually, I show the density and mass in the model tree and I can scan for silly numbers by eye. However, when the assembly has a large number of parts, it is easy to overlook the offending item, especially if it is in a sub-assembly. Is there a way to use the Search icon to look for components in which pro_mp_mass is greater than a certain value, or, indeed, in which pro_mp_density is 1.00? 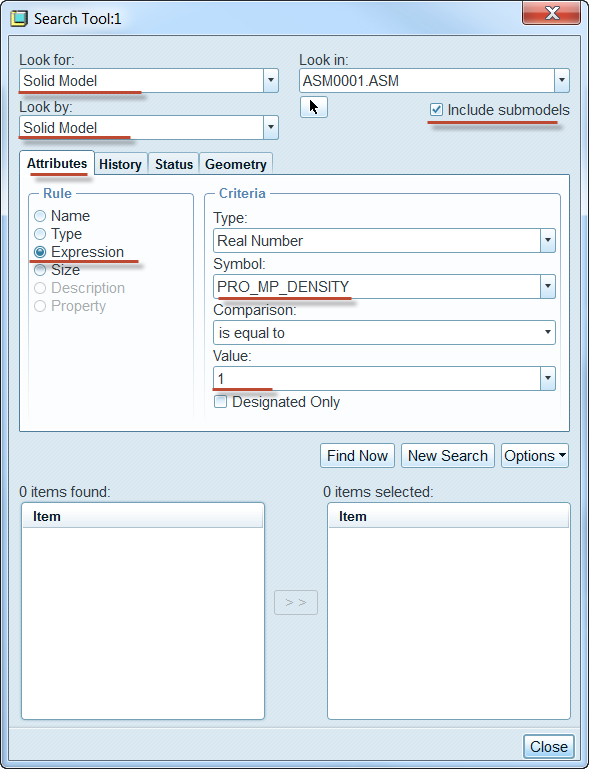 I can only work out how to search for a user-defined parameter called Mass which is greater than a certain value. Our parts do not need a Mass parameter, however, since they automatically have a pro_mp_mass parameter. I am certainly not in a position to add such a parameter to every part in the database. I even tried using Modelcheck to find parts with default density (DEF_DENSITY test), but I couldn't get that to work, wither. I suspect the visual scan is the answer, but, if there is a way to search for a value of pro_mp_mass or pro_mp_density, I would be pleased to hear how. in Creo 2.0 I was able to use the following procedure. I hope that it can be used in WF4, too. I used configuration buttons marked in the above picture.